Kassiblog: Chris Dunn: Setting the Record Straight with Court Documents, Continuing to Work through the Issues, a Stunning Revelation, & the "Feud"
Chris Dunn: Setting the Record Straight with Court Documents, Continuing to Work through the Issues, a Stunning Revelation, & the "Feud"
I've already written a great deal about this case, so why are we talking about it again? In part because one particular organization, Texas Alliance for Life ("TAL"), which promotes itself as a pro-life organization, continues to claim that Texas Right to Life ("TxRTL") and Chris Dunn's representatives are misrepresenting court documents, his condition, his case, and so forth. This is not true in the least. In doing this, they attempt to avoid entirely the overarching issue - the morality and constitutionality of TADA. They attempt to discredit the only statewide pro-life organization that helps patients navigate this law and avoid a hospital committee-imposed death sentence and is the only organization that works to truly reform TADA. I will provide documentation to prove all of this. TAL also makes a shocking argument that you should be aware of as you evaluate all of this. I suspect many are confused about this case, the overarching issues in TADA, and what's up with these two organizations. After this post, you will have no reason to be confused. I'm laying it all out here for you, free of charge. All it requires of you is a willingness to dig deeper, be intellectually honest, and maybe a little caffeine intake. FIRST, the overarching issue in everything related to the Texas Advance Directives Act ("TADA") is the same: It is for the patient to decide when life-sustaining care is to be withdrawn and it is in no way right, moral, or constitutional that a doctor and hospital should make that decision and make it against the wishes of that patient or his closest surrogate, which is not what TADA allows. If there is a conflict between surrogates (because the patient cannot decide on his own and left no written guidance, and even written directives can be ignored under TADA), we err, if we are to err at all, on the side of life. Always. This was the bottom line of my last blog post on this topic and this is our motto going forward. SECOND, Chris Dunn asked that his life not be shortened by the withdrawal of his life-sustaining care. There is video evidence of this. When Methodist decided he was no longer worth allowing to live, on November 13, 2015, he was conscious. We know this because the video evidence of him was taken December 2 and 11, 2015, weeks AFTER Methodist rendered its verdict that his death should be hastened through removing his life-sustaining treatment and administering drugs to speed his death along. The fact that Chris could beg for his life makes this application of TADA even more egregious. It makes any support of what Methodist attempted here by any pro-life organization even more unjustifiable. TAL has mostly ignored the video. When confronted with a question on their Facebook page about it, a TAL board member notes that Chris had to be awakened by his mother to respond to the questions. So? When I'm asleep and someone has a question to ask of me, I have to be awakened. Aren't we all that way? That level of reasoning should give you pause. FOURTH, in no document I have read concerning this case that was filed with either court, was a doctor's conscience given as a reason to withhold life-sustaining care. Why mention this then? Because TAL and its supporters use this argument to justify what was attempted here - and what would have happened here had a lawsuit not been filed - when doctor conscience was not at issue. Moreover, as I have argued before, were that an issue, it could be easily remedied by transferring care to another physician, which seems to be allowed under TADA. (The complication here is that while the statute would seem to allow transfer to another physician or another unit within that facility, this would occur against the backdrop of the ethics committee saying that continued care was inappropriate in general (which is how the letters I've read have been worded). And, if you read what documents that committees give to families (which I show you below), they are weighted very much in favor of moving the patient out of the facility. Moreover, it would be a difficult thing for a doctor in that facility to continue to treat a patient and go against the committee. Doctors have to be granted privileges in a hospital and those privileges can be revoked. The point is, however, that hospitals could allow another doctor within it to treat the patient, but they almost never do it and write letters rendering this option impossible. But that is a matter of how hospitals choose to implement TADA and their own policies. It gives you a sense of their motivation for these decisions as well.) From the beginning of its engagement on this case - which was only after Chris died - the pro-TADA forces (which includes TAL) have argued conscience, as I predicted they would. But that is, as I have said before, a logical fallacy as it is not even an issue here. Don't just listen to me. Wesley J. Smith, an attorney and noted, respected ethicist said the same thing just recently. And, if you read the comments, you'll see a familiar name and argument which he handily addresses. FIFTH, there is no evidence that Chris Dunn's life-sustaining treatment was causing him harm such that it warranted withdrawing it against his will. In two pleadings filed with the Court (but not until December 17, over two months after the decision was made to terminate care and again on January 15, 2016), the attorney for a Methodist employee made that argument, but there is no evidence to support it. Attorney arguments in pleadings are not evidence. They are to be based on evidence or law, but that is not the case here. This is important because TAL is repeatedly saying that Chris's life-sustaining treatment was causing him so much harm that it had to be stopped. There is no evidence to support that assertion. Again, see the Second point above. Section I: I have spent a great deal of time personally combing through the court records for both lawsuits involving Chris Dunn and I am going to provide you with A.) a timeline for both cases; B.) the relevant, substantive court filings in their entirety from the District Court case in the 189th Judicial District Court plus docket sheet as of January 24 only because the court's website is down today); C.) the relevant, substantive court filings in their entirety from the Probate Court case plus docket sheet as of the close of that case; and links to both courts where you can pull all the documents you want yourself and view them. Section II: I will discuss a series of articles, including my own commentary, about this case and refer to the court filings to show where the commentary by a TAL employee and board member errs in representing the facts and court documents themselves so as to promote what can only be described and interpreted as a pro-involuntary euthanasia position. I will also demonstrate other errors of logic, reasoning, and avoidance of the overarching issue. You will find links for prior blog posts by myself and other sources to help work through or otherwise support what I say, in addition to referencing court documents. I'll also show you what Chris's sister, Holly Gomez, had to say about all of this. Section III: I'm going to take on the issue of the "feud" between the two organizations head on. We're going to discuss why that is a non-starter when discussing TADA and how dismissing TADA battles based on the "feud" only puts YOU in harm's way and is a moral and political cop-out. I'm going to tell you about your responsibility to get the facts yourself and to put whatever loyalty you feel about anything toward the issue and not any one organization. By the time you finish reading this, you will be well-equipped to judge for yourself which organization is misrepresenting, not just the facts and circumstances of this case, but the nature of TADA, and the pro-life position. You can judge for yourself which organization has credibility on this issue and in general for that matter. You can judge for yourself whether the actions taken in this case were moral and constitutional. You can judge for yourself if you want to risk being the next victim of TADA or if you want to fight it when the next session rolls around (and fight it now by replacing any state representative or senator who in any way has chosen TADA or a faux reform over the pro-life, pro-patient, anti-euthanasia position). Just so you know, you can look at the court documents concerning the District Court case yourself on the Harris County District Clerk website. You will need to create a login and password. The case is styled David Christopher Dunn, Plaintiff, v. The Methodist Hospital, Defendant, Cause No. 2015-69681, in the 189th Judicial District, Harris County, Texas. For the Probate Court case, which is now over due to Chris's death, you can go to that, separate website. You will need to create a login and password there as well. The case there was styled, Guardianship of the Person of David Christopher Dunn, an Incapacitated Person, Cause No. 444710, in the Probate Court No. 1 of Harris County, Texas. Here is a timeline that is also a summary of what went on in both cases. Below, I will address in more depth and detail the most substantive of these pleadings and present them in full in an embedded PDF. November 13, 2015 - Methodist Hospital hand delivers a letter addressing both of Chris's parents wherein the hospital states in part: "Thank you for meeting with the Committee to tell us of your hopes for Chris and of your request to continue life-sustaining treatment. After hearing from you and from Chris's physicians, the Committee has decided that life-sustaining treatment is medically inappropriate for Chris and that all treatments other than those needed to keep him comfortable should be discontinued and withheld. Eleven days from today, Chris's physicians are allowed to withdraw and withhold life-sustaining treatments and to establish a plan of care designed to promote his comfort and dignity." November 20, 2015, 12:51 p.m. - Chris files a lawsuit against Methodist Hospital assigned to the 189th Judicial District Court, Harris County, Texas, seeking a Temporary Restraining Order ("TRO") and Injunctive Relief. In sum, this lawsuit sought more time for Chris to receive life-sustaining treatment and to enjoin Methodist from withdrawing his life-sustaining care as it said it would do by November 23, 2015. In addition, this lawsuit challenges the constitutionality of TADA in that it violates the due process rights of patients. November 20, 2015, 5:40 p.m. - counsel for Chris files a "Rule 11 Agreement" (an agreement between the parties) wherein counsel for Methodist agrees that Methodist will not violate the terms of the Order from the District Court. December 2, 2015, 5:10 p.m. - counsel for Methodist files a "Verified Plea in Abatement, Special Exceptions, and Original Answer" in the District Court. Methodist asks that the District Court case be "abated" (suspended) until Chris' capacity has been determined in the Probate Court proceeding. This procedural move halts the consideration of the constitutionality of the statute and prevents Chris from proceeding on his own behalf because the hospital argued he was not competent to do so. It also prevents the hearing on the Temporary Injunction. December 2, 2015, 5:18 p.m. - Methodist employee and Chris's assigned social worker at the hospital, Justine Moore, as "Applicant," files an "Application for Appointment of Permanent Guardian of the Person" in Probate Court and requests that the Court "upon hearing, Applicant [defined as Justine Moore] be appointed Permanent Guardian of the Person of the Ward [defined as Chris Dunn]..."
December 4, 2015 - Judge Burke from the 189th Judicial District Court signs the Order of Abatement of that case "pending appointment of a guardian or recognized alternative to guardianship, if any, provided the alternative is approved by the Probate Court and the Attorney Ad Litem...Houston Methodist Hospital voluntarily agrees to continue life-sustaining treatment to David Christopher Dunn during this period of abatement or until such time as a duly appointed guardian, if any, agrees with the recommendation of David Christopher Dunn's treating physicians to withdraw life-sustaining treatment." December 10, 2015 - Evelyn Kelly, Chris's mother, files her "Contest to Application for Guardianship and Alternative Application for Permanent Guardian of the Person" in Probate Court. December 10, 2015 - Ms. Kelly files a "Motion for Independent Examination" of Chris. A request for both a physical and mental examination was made as both had been put into issue by Methodist's and Moore's filings. The Motion notes that the medical records as they stand are unlikely to be unbiased since his treating physician recommended his life-sustaining treatment be terminated and the social worker/employee of Methodist are both likely to be biased. December 11, 2015 - Justine Moore files her "First Amended Application for Appointment of Permanent Guardianship." Moore, as the "Applicant," adds a sentence stating that she is not seeking to be appointed guardian and changes her Prayer. December 14, 2015 - David Lyn Dunn, Chris's father, files his "Original Answer and Application for Appointment of Guardian of the Person" and pleads that he "adopts the recitation of the facts and relief requested in the Application for Appointment of Permanent Guardian of the Person filed on December 2, 2015." In other words, he adopts Justine Moore's language as his own but seeks to be appointed Chris's Guardian. December 14, 2015 - Methodist's Justine Moore and Dr. Aditya Uppalapati file Motions to Quash their depositions. Ms. Moore's attorney claims that counsel is not available for depositions the entire week of December 14-18, 2015. Interestingly, counsel is still filing pleadings during that time (note the date of this pleading and the one filed on December 17, 2015) and there are other attorneys in that firm. (Their website indicates at least four attorneys.) The pleading also says that the Attorney Ad Litem is also not available on December 18, 2015. No alternative dates are given. December 17, 2015 - Applicant Justine Moore files her "Response to Contestant Evelyn Kelly's Motion to Expedite Discovery" in which she argues there is no risk that the hospital will remove Chris's life-sustaining treatment which the Hospital had "voluntarily" continued (only after litigation began) and that Chris might die before the guardianship issue is resolved, but that is because he is sick. December 21, 2015 - the Probate Court Investigator, a Licensed Master Social Worker, files a report dated December 15, 2015, recommending an Ad Litem attorney be appointed. The report notes that, "On the day of the Investigator's visit, Mr. Dunn was awake and attempted to communicate nonverbally by lifting his hands and nodding his head. However, his answers appeared unreliable at times and it was difficult to distinguish answers." No additional context is given for this description. No examples of questions to which "unreliable answers" "appeared" are specified. December 23, 2015 - Chris Dunn dies that morning. December 23, 2015, just after Noon - the Attorney Ad Litem appointed by the Probate Court files Answers to both of Chris's parents' Applications for Appointment of Guardianship. December 28, 2015 - the Probate Court Judge returns the Order for Independent Medical Examination of Chris "unsigned." December 28, 2015 - attorneys for Chris's father file a Motion to Dismiss in the Probate Court based on Chris's death. January 4, 2016 - Justine Moore, Methodist's employee, files her own Motion to Dismiss in the Probate Court based on Chris's death. January 6, 2016 - the signed Motion to Dismiss of Chris's father's application is entered into the record. It was signed on December 31, 2015. The docket has a notation on it "Docket Dropped." January 8, 2016 - Chris's attorneys file a "Motion to Lift Stay and Substitute Parties" in the 189th Judicial District Court. Exhibit A to this filing is Plaintiff's First Amended Petition. In short, Ms. Kelly is petitioning to have her name substituted to continue the constitutional challenge on behalf of Chris's Estate now that Chris has died. She is asserting her own individual case as well. January 13, 2016 - counsel for Plaintiffs file a "Notice of Submission on Motion to Lift Stay and Substitute Parties" which is a matter to be considered "on the Court's Submission Docket for Monday, January 25, 2016 at 8:00 a.m. for consideration and ruling by the Court without the necessity of an oral hearing." In other words, the Court will rule when it rules and without an oral hearing. January 15, 2016 - Methodist files its "Special Exceptions to Plaintiff's First Amended Petition and Motion to Dismiss." In short, the hospital argues that Chris is dead so there is no more controversy, courts do not issue advisory opinions, and there are defects in Plaintiff's First Amended Petition that cannot be cured because Chris has died (the controversy is now "moot"), Methodist is not the one to defend the constitutionality of TADA, so the case should be dismissed. There are some misstatements of fact that have been repeated in other earlier motions filed by either the hospital or Moore. For instance, this pleading also says that the doctors wanted to withdraw Chris's life-sustaining treatment because he was suffering. However, again, that is an argument made by a lawyer. There is no evidence (which is wholly distinct from argument) to support this, including the letter and the affidavit (the same December 2, 2015 affidavit by the same Dr. Uppalapati). If you do a word search in this pleading for "suffer" you see it once, on the first page where counsel argues this. On p. 4 you see that this makes the same misstatement about the Order of Abatement. January 21, 2016 - Plaintiff files her "Response in Opposition to Houston Methodist Hospital's Special Exceptions and Motion to Dismiss." Ms. Kelly notes that Methodist's Motion is procedurally defective, premature, and that there are exceptions to the mootness doctrine, and otherwise demonstrates why the case should go on with Ms. Kelly being substituted in in her own individual capacity and on behalf of Chris's "Estate" which also has causes of action. This pleading also notes, among other things that the make-up and credentials of the committee that sought to terminate Chris's life-sustaining treatment are still unknown. January 21, 2016 - Plaintiff files her "Amended Motion to Lift Stay and Substitute Parties." It argues that 1) the stay should be lifted because there is no longer a guardianship proceeding in Probate Court (and that was the basis of the Abatement) and 2) substitution of parties is warranted because both Ms. Kelly and Chris's Estate have causes of action. January 22, 2016 - Methodist files its "Reply to Plaintiff's Response in Opposition to Houston Methodist's Special Exceptions and Motion to Dismiss." Methodist argues its Special Exceptions and Motion to Dismiss are proper because it believes the Stay it sought prior to Chris's death was lifted by his death. Methodist now claims it does not oppose lifting the Stay. However, Methodist continues to claim that any argument about the committee, etc., is moot also because of Chris's death, but argues that this sort of case does not evade review, but also argues this case should be dismissed. (Yes, I know...) Methodist also admits that "In the instant matter and through counsel's legal efforts, any attempt to discontinue life-sustaining treatment was avoided." (See p. 5.) Now there's an admission! Also, Methodist claims that this is a legislative matter and that, "It is implausible to believe that this is the only instant over the last sixteen years where the issue has become ripe." Another stunning admission! January 28, 2016 - Counsel for Ms. Kelly files a letter with the 189th informing the Court that Methodist has indicated it is withdrawing its previously stated opposition to Plaintiff's Motion to Lift Stay and Substitute Parties and the parties submit jointly an Agreed Order for the Court's consideration. I am embedding the complete documents of certain pleadings that I discuss here in detail for your convenience. I have highlighted, through discussion, the provisions I deem most important to bring them to your attention, but feel free to read the entire thing. That is why they are here. On November 13, 2015, the Methodist Hospital Bioethics Committee hand delivered the following letter to both of Chris' parents, which I think is important for everyone to see for a number of reasons. First, you will note that it is addressed to both of his parents. Second, you will note that the only reference to his parents and their expressed wishes at the hearing is: "Thank you for meeting with the Committee to tell us of your hopes for Chris and of your request to continue life-sustaining treatment." There is no indication here of any dispute with the father. There may or may not have been at this time. I do not know. What I know is what is written here. There is an expressed wish that life-sustaining treatment be continued. Third, the Committee's entire reason for disregarding the wishes of the family - and Chris himself - is: "After hearing from you and from Chris's physicians, the Committee has decided that life-sustaining treatment is medically inappropriate for Chris and that all treatments other than those needed to keep him comfortable should be discontinued and withheld." You will not find the term "medically inappropriate" defined in the relevant statute. Fourth, the letter informs the family that in 11 days, "Chris's physicians are allowed to withdraw and withhold life-sustaining treatments and to establish a plan of care designed to promote his comfort and dignity." It's hard to reconcile "withdrawal and withhold[ing] life-sustaining treatments" and "plan of care designed to promote his comfort and dignity," but this is typical language used by hospitals in this context. You will see this "dignity" language used by TAL as well below. Fifth, try not to choke on the closing sentence: "Houston Methodist is honored to serve your son and you in a spiritual environment of caring." As they seek to withdraw his ventilator and administer drugs to hasten his death. Yes, very spiritual. Next, scroll down to page 5 and 6, which lists facilities and organizations willing to help assist transfer of patients on whose behalf life-sustaining treatment is sought. You see a few attorneys, a few others, the Pro-Life Healthcare Alliance (an excellent organization, by the way), and Texas Right to Life. Notably not listed is Texas Alliance for Life because it does not help patients navigate or survive TADA. Rather, TAL aids and abets those that support TADA and the denial of basic due process rights and basic care to patients against their will. The next significant event is Chris Dunn filing a lawsuit in District Court on November 20, 2015, at 12:51 p.m.
Texas Health & Safety Code 166.046 violates Plaintiff's right to procedural due process by failing to provide an adequate venue for Plaintiff and those similarly situated to be heard in this critical life-ending decision. The law also fails to impose adequate evidentiary safeguards against hospitals and doctors by allowing them to make the decision to terminate life-sustaining treatment in their own unfettered discretion. Finally, the law does not provide a reasonable time or process for a patient to be transferred. The lawsuit asserts a Declaratory Judgment cause of action under Chapter 37 of the Texas Civil Practices & Remedies Code that pursuant to Amendment 14 of the U.S. Constitution and Article 1, Section 19, of the Texas Constitution, that Methodist's planned withdrawal of Chris's life-sustaining treatment under the Texas Health & Safety Code infringes on his due process rights. guarantees every person who "under color of any statute...subject or causes to be subjected, any citizen of the United States or other person within the jurisdiction thereof to the deprivation of any right...secured by the Constitution...shall be liable to the party in an action[.]" Please read the rest of the challenge and acquaint yourself with what so many of us have been arguing for so long. There is no due process in this law. Please read this short agreed Order carefully. In the second full paragraph you will see that the Judge finds: "Plaintiff is suffering and will continue to suffer irreparable harm if Defendant is permitted to remove life sustaining treatment ("LST") from Christopher David Dunn. Plaintiff will be irreparably injured, and suffer loss and damage by likely death if LST is removed." A couple of comments about this. First, you will hear a great deal from TAL and the pro-TADA forces stating that "...treatment was causing unbearable harm to the patient." I can find no evidence in the documents that support this statement by an organization that in no way was involved in this case; at least not first-hand. The Committee Letter does not say this. And, the Agreed Order does not say this. The other documents I attach do not say this, except by way of counsel's arguments. There is no evidence to support this and there is a big difference between evidence and argument. I have run an OCR on each document so you can conduct word searches. And, for the documents I do not provide here in their entirety, I have shown you how to pull them yourself. What this Agreed Order does say is that Chris will suffer harm from the withdrawal of life-sustaining treatment. That should be obvious. Now look at page 1, the second to last full paragraph which reads in full: "Such harm is imminent because if an injunction is not entered, Defendant may remove LST on Tuesday, November 24, 2015, and may administer drugs resulting in death." (Emphasis added.) Remember, Methodist agreed to this language and I am, frankly, shocked. Why? Because Texas law prohibits "mercy killing" which is "an affirmative or deliberate act or omission to end life..." See Tex. Health & Safety Code Sec. 166.050. If drugs are administered to cause death, it seems to me that this statute would be violated. And, recall that Ms. Kelly reported that she was told that the hospital would do just that. This was addressed in my first post about Chris Dunn. This should outrage you. It should further outrage you that a pro-life organization is defending the hospital's attempt to take a life against his will and failing to address this issue of the possibility of the administration of drugs to further hasten death. The final paragraph of interest on page 1 states: "Plaintiff has demonstrated a likelihood of success on the merits of this case and a balance of the equities strongly favors the granting of injunctive relief in order to preserve the status quo ante." On page 2 you see that this is only good for 14 days until there is a hearing which was scheduled for December 3, 2015. The signatures of all parties are under the statement "AGREED AS TO FORM AND SUBSTANCE." Again, this is unlike the Order of Abatement where all the signatures are under the statement "AGREED AS TO FORM." But on December 2, 2015, at 5:10 p.m., the eve of the hearing on the TRO, counsel for Methodist files a "Verified Plea in Abatement, Special Exceptions, and Original Answer." Basically, Methodist argues that since it was also filing an Application for Guardianship, done through its employee and the social worker assigned to Chris Dunn, they are challenging Chris's capacity to bring a suit in his own behalf. Thus, they argue, the lawsuit should be "abated" until the guardianship issue is decided. The Special Exceptions portion claims that the lawsuit "fails to set forth a claim upon which relief can be granted" and that "Plaintiff alleges no cognizable cause of action under Texas common law, statute, or constitution." (See p. 2.) That's absurd as set forth above. The Texas Declaratory Act was invoked, as was the Texas and U.S. Constitutions, and the Texas Health & Safety Code. Lawyers frequently throw in boilerplate language in initial answers like this that, when challenged, are not successful. The real point of this filing is to stop the TRO hearing and put this in Probate Court to stall things, including fact discovery and a ruling on the constitutionality of TADA. Methodist also enters a "General Denial" and the only Affirmative Defense set forth is the failure to state a claim upon which relief may be granted. Of course, Answers are frequently amended and supplemented as litigation progresses. The affidavit concludes: "This incapacity began on October 12, 2015 and in reasonable medical probability will continue until his death." (See par. 7, last sentence.) As you will see below, the Physician's Certificate Dr. Uppalapati signed to support Moore's Application to be named guardian over Chris, was signed on the same date he signed this affidavit. Dr. Uppalapati's Certificate checks the box that "YES" Chris has a possibility of improvement in his medical and mental functioning and that Chris should be reevaluated in "1 month (30 days)." That Certificate also states that the "frequency, severity, or duration" of Chris's "cognitive deficits" actually "vary substantially." That supports what Chris's family, attorneys, and advocates say. It also does not support TAL. Both the affidavit and Physician's Certificate are dated December 2, 2015. This is the same day as one of the videos showing an alert Chris. This is also nine days before the video of December 11, 2015 showing a responsive Chris Dunn, begging for his life by holding his hands in prayer and nodding his head as best he could. Also, there are some discrepancies between the affidavit and Certificate. This calls the credibility of the sworn affidavit into question immediately. Affidavits lacking credibly are often stricken in a court of law. You will also note a lack of reference to medical tests and data in the affidavit. Affidavits that are overly "conclusory" without a factual foundation are often stricken in a court of law. Now, pro-TADA people will say that HIPPA laws prevent a great deal of information from being released by Methodist or Moore about his condition. Well, documents can be filed under "seal" so that the court has access to them and the public does not. There is no indication that a Motion to File Documents under Seal or any such similar procedural action was taken by any of the attorneys representing Methodist or its surrogates. On December 4, 2015, the Judge signs the Order of Abatement. There is no finding by Judge Burke that Chris Dunn is incapacitated. Indeed, the Order language states "if any" twice, meaning if any guardian is appointed. In any event, there is no mention of incapacity other than in the title of the Probate case itself. The details matter. If one will misrepresent small things that do not ultimately change things, they will the bigger, meaningful things. Also note that it was "Agreed as to Form." This is significant because sometimes attorneys agree with an Order as to "form" but not the "substance." In other words, they might realize that the judge is inclined to go along with the other side so rather than have the hearing, they agree to the "form" but not the substance because they know that the issue is going to be fought a different way. At this point in the timeline, everything moved to Probate Court. The District Court case picks up in January of 2016 with the aforementioned Motion to Lift Abatement and Substitute Parties. For your edification, I will embed the Motion to Lift Stay and within that you will find the First Amended Petition and the most recent documents below. I'm not going to say a lot more about them right now. I may, depending upon how this all plays out, do a separate post discussing the arguments later. Here is the hospital's "Special Exceptions to Plaintiff's First Amended Petition and Motion to Dismiss." Here is "Plaintiff's Response in Opposition to Houston Methodist Hospital's Special Exceptions and Motion to Dismiss." Here is "Plaintiff's Amended Motion to Lift Stay." Here is Methodist's "Reply to Plaintiff's Response in Opposition to Houston Methodist's Special Exceptions and Motion to Dismiss." That fact is not made clear at all in the Application. It seems to not even be hinted at. She is represented by a different law firm than Methodist in the 189th proceeding. This Application is significant for a very important reason. TAL and its representatives have denied TxRTL's reports that Methodist was seeking guardianship over Chris. The fact is, however, that if you look to Section XV. on page 6, it says, "Applicant prays...(iv) that upon hearing, Applicant be appointed Permanent Guardian of the Person of Proposed Ward...." (Emphasis added.) The Proposed Ward, of course, is defined as Chris Dunn. Now, I am aware that one of TAL's board members dismisses this and refers readers to Section II. on page 1 which states: "Applicant desires that a qualified family member or an independent third party be appointed guardian of the person of the Proposed Ward." Significantly, this statement does not necessarily eliminate Moore from being in consideration as "an independent third party." Remember, Methodist maintains it was acting in Chris's best interest all along. It may very well believe it and it's employees are "independent." Tellingly, this is addressed in the Amended Application to be discussed in a bit. The point here is that at the time the statements were made in and to the press about Methodist seeking guardianship of Chris, they were absolutely, 100% true and verifiable by looking to Court documents. Note also that Moore signed a Verification, swearing to everything in her Application. (See p. 7 of the PDF above.) TxRTL and others are being accused of lying about this. You be the judge. You now have the documents that TAL has not publicized. Something else you will not hear TAL and its surrogates talk about is what exactly was said in the "Physician's Certificate of Medical Examination" which accompanied Moore's Application for Guardianship. It is Exhibit A and you can find it as part of the PDF above. It was dated December 2, 2015, and signed by Dr. Uppalapati. The question is asked where there is a possibility for improvement of Chris's mental and physical functioning. The doctor who had recommended the termination of Chris's life-sustaning treatment to the Methodist Ethics Committee, which the Committee affirmed, is stating here there is a possibility for his improvement and he should be re-evaluated in "1 month (30 days)." On page 2 under 4.b., the doctor noted that he could not assess Chris's long and short term memory. In section 4.c., he checks "YES" to answer whether "The Proposed Ward's periods of impairment from the deficits indicated above (if any) vary substantially in frequency, severity, or duration." If these impairments "vary substantially" in their "frequency, severity, or duration" then it is entirely consistent - based on Methodist's own doctor's documentation - with what Chris's lawyers, mother, and advocates such as Texas Right to Life have stated about his ability to understand what they said to him and his ability to decide - to pray - that his life-sustaining treatment be continued. In other words, Dr. Uppalapati's Examination here, while providing a basis for the determination that Chris was legally in capacitated as a matter of legal definition, also supports what we saw in the videos and what his family and advocates reported. It also shows that in some important respects, Dr. Uppalapati's Certificate and Affidavit are contradictory. On December 10, 2015, Chris's mother, Evelyn Kelly files three pleadings in Probate Court. The first is her "Contest to Application for Guardianship and Alternative Application for Permanent Guardianship of the Person." Ms. Kelly's "Contest" references the video of Chris pleading for life-sustaining treatment to be continued and notes that as an EMT he is "aware of what life sustaining treatment entails." This is a detail that is omitted from those who are commenting and writing about this case that support what Methodist Hospital attempted to do here. The first section of Ms. Kelly's "Contest" also provides a summary of the procedural background for the case up to this point. It also notes that as of this filing Justine Moore, an employee of Methodist, "who assisted in the hospital's determination to remove life sustaining treatment from Proposed Ward to Contestant, applied to be the Permanent Guardian of David Christopher Dunn." (See p. 2; n.2.) The Contest notes that prior to his hospitalization, Chris had been living with his mother, cared for by her, and supported by her. Ms. Kelly pleads in this Court document that she is best able to represent his interests, not an employee of the hospital. The Methodist Hospital and its agents or employees, including Ms. Moore, should be estopped from asserting the Contestant [Ms. Kelly], as the mother of the Proposed Ward, is an inappropriate person to assist the Proposed Ward without a guardianship since the hospital has previously relied on Contestant as a medical surrogate for Proposed Ward. (B) Consent to psychological and psychiatric treatment, nor or in the future. I point this out because it has been alleged by the Methodist apologists that Chris, his mother, his lawyers, blog posts, and the court documents demanded biopsies, "searches for and trials of treatment of the cancer," and so forth. If you read the blog posts I link here, that is not quite true. If you read my blog posts, you see that I am critical of Methodist for not confirming a diagnosis and I wonder what "might have been" had that been done. I think it is sloppy medicine to fail to confirm a diagnosis. Methodist did not bother to find out what was actually wrong with Chris. There was a mass on his pancreas but it was left unidentified. Many of us have pointed out that a diagnosis was made based more on assumption than medical tests. Methodist's own pleadings admit there is "suspected metastasis." In addition, Dr. Uppalapati's affidavit states that, "Based on my education, training, experience as well as my care of Mr. Dunn, I, and members of my team, have advised his family members that Mr. Dunn suffers from end-stage liver disease, the presence of a pancreatic mass suspected to be malignant with metastasis to the liver and complications of gastric outlet obstruction secondary to his pancreatic mass." (See par. 4.) I read this to be that the doctor suspects malignancy and suspects metastatis. I also note that he does not base his opinions on any tests whatsoever. The next sentence of that affidavit lists other conditions Mr. Dunn is said to have. Again, there are no tests referenced. No response to the question of Ms. Cheshire was offered. And, that is the big question which is never answered by those that support TADA and its usage, in this case and in general. Texas Right to Life pointed out that Methodist did originally agree to do a procedure which would make it possible to transfer Chris, but then changed its mind allegedly because of Chris's father's objections. This initial willingness to engage in that procedure in mid-December undermines the argument by TAL that Chris could not withstand any procedure. Remember also the Physician's Certificate of December 2, 2015, by Dr. Uppalapati says his mental and physical state had a possibility for improvement. He was there from October 12, 2015, and I can't help but wonder what might have been had treatments other than life-sustaining treatments been offered, but of course, that might require a definitive diagnosis. We will never know. But the moral and legal failing here is seeking to withdraw life-sustaining care from a conscious man against his will as a means to hasten his death. Note that TxRTL's post linked above was addressing a procedure needed to transfer him to another facility to care for him since Methodist would not. There are not just assumptions by Methodist as to Chris's condition, but TAL's MD board member compounds that speculation with more. As for the court documents, if you read the Original Pleading filed by Chris in the 189th, you see no such request for even a biopsy, much less cancer treatment (if he had cancer). You will see a request that his life-sustaining treatment be continued and a challenge to the constitutionality of TADA. I have seen no demand for any extraordinary procedures, including a searches for and trials of the treatment of the suspected cancer, in court documents. That is also not consistent with what you see in the Contest filed in Probate Court by Chris's mother, quoted above. In fact, it is admitted that he likely has a terminal illness. It was assumed to be cancer by Methodist, but was not definitely established. But again, his exact condition is not the overarching issue here. And even were it as Methodist described, it would not be morally legitimate to withhold life-sustaining treatment from him against his will to hasten his death and certainly not to administer medication to do so. I have addressed this tendency among pro-TADA/Methodist apologists to overstate what those of us who are against TADA and pro-life desire in my last post on December 30, 2015. (See the section entitled "Red Herring, Straw Man, Anyone?) In posts written by TAL-linked individuals since then, they have done just this repeatedly. It is a distraction. Ignore that. The issue is whether it is moral to withhold life-sustaining treatment against a person's will (or his closest surrogate's) in order to, or which will, hasten his death. It remains to be addressed by those supporting Methodist and TADA. That is telling. 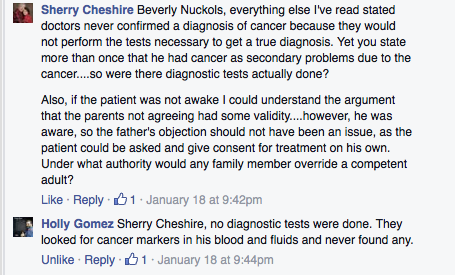 Ms. Kelly's Contest concludes by requesting a independent medical examination of her son which is not unreasonable. His condition was put into issue by Methodist when they filed, through their employee, an Application for Guardianship asserting he was in need of permanent guardianship for all purposes. Ms. Kelly contests this and if a guardianship was necessary, she wants to be it and have it as limited as possible. The second pleading filed by Ms. Kelly on December 10, 2015, is a "Motion for Independent Medical Examination." This is a request that is common when a person's physical or mental condition is in controversy as it most certainly was here. It notes that Dr. Uppalapati is an interested party in the case (meaning, not unbiased or without a conflict), as this is the doctor that recommended Chris's life-sustaining treatment be withdrawn which was affirmed by the Ethics Committee. Yet it was the Certificate by Dr. Uppalapati that supported Ms. Moore's request for guardianship over Chris. I have also pointed out some things that made the credibility of this Certificate (and his Affidavit) questionable. An IME as well as depositions of the interested Methodist parties, would have helped clear up some of the untested, sparsely supported, and disputed (with evidence) contentions about Chris and maybe even have provided a definitive diagnosis. There was never a ruling on this Motion. The third pleading filed by Ms. Kelly on December 10, 2015, was a "Motion to Expedite Discovery." Discovery is what we attorneys call the fact-finding and expert opinion gathering we do in cases. Some of it is done via paperwork, some is done through reports, and some is done through sworn depositions. It can go on for a while. However, in some cases, it needs to be sped up. For reasons that should be obvious, time was of the essence in this case. The guardianship action had been filed, which abated the Constitutional challenge and further hearings on the TRO to prevent Methodist from withdrawing life-sustaining treatment. Allegations had been made as to Chris's mental and physical state that went directly to determining what level of guardianship should be had over him, if any. Relevant to all of these issues were facts that could only be elicited through expedited discovery. Recall also that at this point, Ms. Moore's Application still requested that she, a Methodist employee, be appointed guardian of Chris and that application was supported by the doctor that recommended his life-sustaining treatment be terminated. However, in footnote 1 on page 2 of this pleading, you see that Moore's attorney represented to Chris's attorney that Moore's Application was mistaken. That was some mistake! It is not like it was a typo. The relief requested was spelled out in at least 13 words in section (iv) of the final paragraph of her Application which is called the "Prayer" for relief. Of course, by this time, there was an enormous amount of media pressure and attention being paid to this case. Please also note Exhibit A to the Motion to Expedite Discovery, the affidavit of one of Chris's attorneys, Joseph M. Nixon. (You can scroll through the embedded PDF above to see it.) Mr. Nixon recounts his meeting with Chris and references the video of it. He also recounts that although Methodist knew he was representing Chris, the hospital without notice to him as Chris's attorney, conducted an examination of Chris to support Moore's Application to be named guardian of Chris. No HIPPA release was obtained. This calls into question the good faith of the Methodist parties, which had direct bearing on the guardianship issue, among other things. The affidavit ends with a plea that this issue be taken up quickly because Chris was beginning to develop life-threatening pneumonia at the time. On December 11, 2015 Justine Moore, the Methodist employee, files her "First Amended Application for Appointment of Permanent Guardian of the Person" at 5:22 p.m. So from December 2, 2015, at 5:10 p.m. to December 11, 2015, at 5:22 p.m. - nine days - Moore was officially seeking to be named Chris's guardian. Whether a "mistake" or not, you must understand that what is in black and white and filed with the court is what attorneys (and their clients) live and die by. What was on the record was on the record. It is as clear as can be. Therefore, at the time that Chris's attorneys, family, Texas Right to Life, and others were saying that Methodist was seeking guardianship over Chris, it was, through its employee. I wrote my first post about this case and mentioned the guardianship issue on December 7, 2015. The claim by TAL and others that Methodist did not ever seek guardianship over Chris is false. It did. It may have amended the request after the media got involved and the litigation proceeded, but it most certainly did initially. As noted in the timeline above, in the Amended Application, a sentence is added in section II. that was not there before that "Applicant is not seeking to be appointed Guardian of the Proposed Ward." Then in the Prayer on page 6, the former request numbered (iv) is gone. Sentence (ii) asks that "a qualified family member or an independent third party be appointed Permanent Guardian." On December 14, 2015, at 1:57 p.m. Applicant Moore files a Motion to Quash her deposition and that of Dr. Uppalapati. This was discussed in the timeline above and there is not much more to say about it. It is a tactic used to stall discovery and is automatically granted if filed within three days of the Notice of Deposition. It is clear from this and Moore's response to Ms. Kelly's Motion to Expedite Discovery that Methodist was not keen to get facts out in this case and have its opinions and evaluations challenged under oath. Also filed on December 14, 2015, at 2:27 p.m. is the Original Answer and Application for Appointment of Guardian of the Person by David Lyn Dunn, Chris's father. His Application actually "adopts the recitation of the facts and relief requested in the Application for Appointment of Permanent Guardian of the Person filed on December 2, 2015, in the above styled and numbered cause." (See p. 1.) This is curious because that Application had as part of its request for relief that Applicant Moore be appointed Chris's guardian and by now her Amended Application was on file. Mr. Dunn uses the Certificate of Medical Examination of Dr. Uppalapati that was used in Moore's December 2, 2015, Application. By now, however, the videos of December 2 and 11, 2015, showing a responsive Chris have been released calling into question the assertions of Moore, Methodist, and Mr. Dunn. Notably, unlike Chris's Mother's Contest (which included her request to be his guardian), Mr. Dunn does not state that Chris lived with him, that he had been caring for Chris, that the hospital had been relying on him as a medical surrogate for Chris, or that Chris had ever expressed a preference that his father be his guardian. On December 17, 2015, Applicant Justine Moore files her "Response to Contestant Evelyn Kelly's Motion to Expedite Discovery." As far as I can tell, this is the only pleading that TAL put on its website to which its surrogates referred when writing the Public Discourse piece I will discuss below. It has a number of exhibits which are prior filings, but it is not a full PDF of all substantive documents filed in this case, as you should now be able to see for yourself. This is especially the case when TAL uses this to "prove" that Methodist was not seeking (and never did seek) guardianship over Chris. Within this document is a blatant lie in this regard which has been repeated over and over. But you now know better because you've seen the entirety of the documents. This Response served to stall the discovery process and avoid getting the facts out and having the Methodist employees or representatives involved in the decision to terminate Chris Dunn's life-sustaining treatment deposed under oath. The attorneys claimed that time was not of the essence because they were no longer going to withdraw Chris's life-sustaining care given the Order they agreed to. Okay. There are still questions to be answered that Methodist clearly does not want to do under oath. There is simply no way one can honestly say that Justine Moore was never seeking guardianship over Chris Dunn. This pleading does not state that such a request was a mistake, but that it was "never" made and omits reference to the prayer language entirely. Also, this appears to be where TAL gets its support for its claim that the doctors wanted to withdraw life-sustaining treatment from Chris because it was harming him. It is on page 3. That, however, is the argument of counsel. Argument of counsel is not to be confused for facts. I can find no affidavit from any physician or medical personnel that says this. No citation to evidence is provided. The only citation to evidence on this page is the letter from Methodist. It stated the treatment was "medically inappropriate" but did not elaborate. It said nothing about suffering or harm. Even if it had, that decision is not the hospital's to make. Chris Dunn gets to make that decision or his closest surrogate. In this case, that was his mother. Even his father's Application did not dispute her claim - under oath - that Chris had expressed his desire that his mother be his guardian. And, I wish to clarify something else. A particular TAL board member has said that the term "medically inappropriate" is defined by TADA. It is not. You can read the entirety of the statute here. You will not find a definition for that term. Definitions are provided in Section 166.002 and 166.031. But do a word search for "medically inappropriate" and you will find it used once in Sec. 166.046(e) and twice 166.052. Each time it is used it is done so without definition or explanation. I have searched all Texas statutes and cannot find a definition even outside of TADA for medically inappropriate. Indeed, it is the subjectivity with which TADA can be applied that is one of its many problems. This is but one such example. This pleading filed by Moore's/Methodist's attorneys also "misrepresents" other aspects of this case so far. As mentioned above, I have embedded the Abatement Order from the 189th proceeding because of how this Motion lied about it. On pages 5-6 in this Motion it is alleged that "Judge Bill Burke agreed with the assessment of the Proposed Ward's incapacity and executed an Order of Abatement, the form of which was agreed to by counsel for all parties." As already explained, there is no finding by Judge Burke that Chris Dunn is incapacitated. Indeed, the Order language states "if any" twice, meaning if any guardian is appointed. In any event, there is no mention of incapacity other than in the title of the Probate case itself. The details matter. If one will misrepresent small things that do not ultimately change things, they will the bigger, meaningful things. Again, note that it was "Agreed as to Form." This is significant because sometimes attorneys agree with an Order as to "form" but not the "substance." On December 21, 2015, the "Court Investigator Report Pursuant to Sec. 1054.151 & Sec. 1102.001 of the Texas Estates Code." The date of the visit is December 14, 2015, so I am not clear as to why it took so long for this to be filed. As noted in the timeline above, contrary to what TAL, et al, say, Chris admittedly "attempted to communicate nonverbally by lifting his hands and nodding his head." It continues, "Unfortunately, his answered appeared unreliable at times and it was difficult to distinguish answers." As I have noted, there is no example or elaboration given. This is more than two months after he was admitted on October 12, 2015. I am reminded of my own role as a mother of a toddler who is learning to communicate. I understand him very well at this age, as do his father and siblings. Others may not. That does not make him unable to communicate. It makes others unable to understand fully his more limited or different means of communication. Chris was admittedly in a bad state and, given the intubation and medication, his ability to communicate may not have been clear to others, but I am certain it was to his mother. However, she was not given her due as his mother and the person by his bedside day after day and night after night. That a stranger couldn't understand him does not mean that his answers were not clear and consistent. Note that the investigator qualified the description above with "appeared" and "at times." Like my toddler, it is every bit as possible that it was not an inability to communicate that was the issue so much as an inability to be understood. These are not the same concepts. Remember also the Physician's Certificate of December 2, 2015, by Dr. Uppalapati says his mental and physical state had a possibility for improvement. On December 23, 2015, Chris succumbed to whatever his underlying illness or condition was. The lawsuit was successful in making sure that it was not the withdrawal of his life-sustaining care and possibly the administration of drugs that hastened his death. Upon Chris's death, Ms. Kelly thanked the nurses for their care of Chris and the hospital for not withdrawing his life-sustaining care. But she made it clear that she was going to continue fighting against this law so others would not have to go through what her family did. All other filings in the Probate Court after this date are "housekeeping." A couple of parties sought dismissal, which the Court granted to the first one who filed. Here is a PDF of the Probate Court docket sheet. The case now sits back in the 189th District Court, as I noted in the last section. A. Dr. Hawley Writes: "A Tragic Case of Modern Bioethics: Denying Life-Sustaining Treatment to a Patient Who Wanted to Live"
To my knowledge, Dr. Hawley has not been engaged in any TADA-related lobbying or politicking in Texas. From what I can tell through googling, he has no dog in this fight and this is his first commentary about TADA. I was taken with his column, not just because I agree with so much of it, but because he writes as a doctor who has "been there" on end-of-life issues and yet he still understands the ethics of not withdrawing life-sustaining treatment against a patient's will in a case like Chris's. I was actually going to write a blog post responding to some commentary I read about how no doctor opposes what Methodist sought to do (or something like that) when this article came across my Twitter feed. Dr. Hawley's calm, reasoned, respectful article based on court documents and was helpful to me and I hope it is to you as well. I encourage you to read the entire thing. Contrary to exceedingly vitriolic, baseless attacks made against him in the last couple of weeks by the same TAL board member that wrote the response to him in Public Discourse, but in a significantly different venue (and tone), Dr. Hawley was actually extremely deferential to Methodist as an institution and the doctors there. In fact, he stated: "I have no doubt that his physicians at Methodist Hospital in Houston, Texas, did everything within reason to devise a cure and, when that was deemed impossible, to provide pain relief and comfort care." I actually disagree with this, but this shows that although he has ethical problems with aspects of this law and how it was sought to be used here, he gives every benefit of the doubt to Methodist. In fact, he has no doubts here about how great a job they did in caring for Chris. Dr. Hawley also wrote: "There are circumstances in which the Texas law would serve a justifiable purpose." He then gave an example and noted that nothing like that existed in this case. Again, he is reasoned, logical, and respectful. He then noted that Chris was "fully awake, cognizant (though unable to speak because of the breathing tube in his throat), and literally begging to live when the hospital ethics committee convened to decide his fate." This was not a situation in which doctors were up against the limits of medical technology, the treatment was causing significant harm to the patient, or the benefits of continued care had ceased. On the contrary, the technology involved in this patient's care is commonplace, the patient wanted treatment to continue, and its benefit was obvious in keeping him alive. Despite these facts, the committee voted to withdraw life-sustaining care. In other words, they voted to terminate Chris Dunn's life. When his family resisted, attorneys for Methodist Hospital petitioned the court to appoint their designee as the patient's legal guardian so that they could end his life. It is difficult to imagine a more malevolent perversion of the word "guardian." Having participated in many treatment discussions on behalf of terminally ill patients, I will readily acknowledge that patients and families sometimes have unrealistic hopes for a cure. However, acknowledging this possibility does not redeem a badly flawed law or vindicate a morally corrupt decision. In deciding to withdraw life-sustaining treatment from an alert and cognizant patient who so obviously wanted to continue living, the hospital and its ethics committee stole from him two most fundamental rights enumerated in our Constitution: life and liberty. This was very balanced in my opinion. I have long noted, as have others, that proponents of TADA do not like it when the term "death panels" is used or anyone says that an ethics committee has pronounced a sentence of death or something similar. People don't like that I said in my first post on this case that the hospital was using TADA to "kill" a patient. But that is the net result of what they do. It is undeniable and undebatable. If a hospital withdraws life-sustaining treatment, by the very definition of life-sustaining treatment (which is found in TADA, by the way), life will cease. In other words, the hospital - voluntarily - makes a decision to stop the thing helping the ill patient live and by the hospital's voluntary action and stopping the life-sustaining treatment, the life is no longer sustained - the person dies. That is no mystery. It's not hard to understand. Texas hospitals are doing this - and Methodist would have succeeded in doing this had a lawsuit not been filed. Every time a hospital withdraws life-sustaining treatment it deems futile or "medically inappropriate" (whatever that means), they are hastening a patient's death. That is the purpose of withdrawing care. That is not debatable. That is a fact. In this case, we have the added detail of Methodist personnel telling Chris's mother that they were going to administer a drug after they withdrew his life-sustaining care. Note also, as mentioned above, that the Agreed Order had language in this that Methodist apparently did not dispute. In the next section entitled "Virtue Has Left the Room," Dr. Hawley looks to what the hospital spokesman said as insight into the committee's deliberation: "We feel strongly that every decision we have made is in the best interest of the patient." Dr. Hawley, as so many of us have, noted that "[r]elative strangers with little or no knowledge of [Chris's] values and beliefs weighed his 'quality of life' and decided that he no longer deserved to live." Dr. Hawley recounted situations he's seen where parents of an ill child or a lifelong spouse struggle to discern what the right thing to do is in these situations. But, here, you have a hospital board tell the family that they know what is in Chris's best interests. And, Methodist is no exception. This happens in Texas with regularity as I and others have reported. The inconsistency of modern bioethics is breathtaking. On the one hand, if you want to end your chronic suffering or deal with a terminal illness by committing suicide, today's utilitarian ethicists will invoke personal autonomy as the guiding principle and endorse your plans. But if you choose to continue living in spite of your suffering or terminal diagnosis, those same ethicists brush aside the notion of personal autonomy, label your request as unreasonable, and conclude that you are sadly incapable of making the "right" choice. Under the traditional Hippocratic oath, physicians vow: "Whatever houses I may visit, I will come for the benefit of the sick," and "I will keep them from harm and injustice." For over two thousand years, physicians pledged to care for and protect the weak and infirm, and deeply imbedded in this convenant was the idea of equality. This case shows how far we have drifted from those precepts. Today, medical ethics committees go behind closed doors to decide whether a fully cognizant patient begging to live is worth the physician's effort. It is a morally impoverished society that would withdraw life-sustaining treatment from a dying man and steal from him any chance for spiritual serenity when he needs it most. It is worse still that this was done by a self-described "faith-based" organization. Under what precept of Christian faith does someone claim authority to play God? Let me pause here to note that the same TAL board member who attacked Dr. Hawley most uncharitably last week, also engaged Chris Dunn's sister and others on TAL's Facebook page on this issue. (As if his poor sister has not been through enough.) The TAL surrogate (who to my knowledge is not Catholic and Dunn's sister made it clear that she is not Catholic) claimed - without attribution - some statement by Pope St. John Paul II to support TADA. This is absurd, incorrect, and patently offensive to me. Wesley J. Smith debunked this argument years ago by noting that the now-sainted Pope surely did not mean for someone other than the patient to make this decision. I am aware that the Texas Catholic Conference of Bishops supports TADA (or at least has opposed meaningful reform and supported faux reforms repeatedly) and there is a close association between the TCC and TAL. This is unfortunate and to the detriment of all people of Texas who live under the threat of TADA. I have written about his often as has Bishop Gracida. (And Judie Brown.) The TCC is in error. You will not find - and they have never provided - a single official Catholic Church teaching that says that it is morally acceptable for a hospital to decide to withdraw life-sustaining care against that person's wishes. Not a single one. I have gone through them. The exceedingly rare, narrow exceptions made are not applicable here or in most cases because the requirements are not going to be met by doctors. Again, my piece on Bishop Gracida's blog addressed this. These distinctions are ignored by TAL, et al. Do you own reading on these matters whether you are Catholic or not. Dr. Hawley's point about allowing a person at the end of their life to die with a chance to achieve spiritual serenity is not a throw-away point. It has eternal implications for the individual that no outsider should interfere with - including a doctor or committee. Dr. Hawley concluded with a hope that Chris Dunn's death "will serve a noble purpose if it spawns a public debate and helps to rekindle a respect for all human life" if it is not too late. B. TAL's Response: "Balancing the Rights of Patients and Doctors: Another Perspective on a Tragic Case"
The bottom line in this piece was, as the summary provides, we should give the benefit to the Chris's doctors and the ethics committee because we do not have all the facts. The authors, both part of TAL (their bios are at the bottom of their response), claimed that Hawley was incorrect and that their version, which they claimed comes after "[a]n examination of court records," provided more key details about Chris's condition and the decision-making process. They also claimed that Dr. Hawley's "assertion that Dunn was subject to 'death by committee' supposes an improper standard: namely, he assumes that the hospital and attending physicians are guilty of murderous intentions until proven innocent." They then claimed that "On the contrary, a review of the facts indicates it was possible and even plausible that they did not intend to cause Dunn's death." Then they claimed that Dr. Hawley did not "account for important implications of the conscience rights of doctors, who should not be bound to continue medical treatments that they believe to be causing more harm than good." TAL contended that this was "a case of an incapacitated patient who was terminally ill, whose parents disagreed about the best course of treatment, and whose doctors believed the life-sustaining treatment was causing suffering, as is plainly evidence from court documents." TAL then cited to the court documents I mentioned above, the pleading opposing expedited discovery filed by Moore. Let's pause here for a moment and look at what this says. TAL is writing in support of Methodist's actions which were initially going to include taking Chris's life against his will through removal of his life-sustaining treatment (and possible administration of drugs to hasten his death). TAL claimed (and continues to do so) that the doctors believed his life-sustaining treatment was causing "suffering" - not causing harm disproportionate to the benefit. These are two different considerations. Merely causing "suffering" - a term that is, by its nature, subjective and will necessarily vary from person to person. Next, understand that despite what TAL says, even if we euthanized suffering patients and this was moral, the evidence does not say that Chris was suffering from the treatment and that was a basis for terminating it. Methodist/Moore attorneys have said this in two pleadings without reference to any evidence. The affidavits did not say this. The hospital letter did not say this. Also, review what Dr. Hawley said above about how the treatment was not causing significant harm to the patient. In fact, the ethics committee letter does not even say that the life-sustaining is causing harm disproportionate to its benefit. For instance, as I have written before, there are times where providing artificially administered nutrition and hydration (a form of life-sustaining treatment) could actually cause a patient's lungs to fill up with fluid at the end of life preventing breathing. In that case, the life-sustaining care would itself hasten the patient's death. It would not be medically or morally appropriate. In this case, there was no finding that the ventilator or any other life-sustaining care was itself hastening Chris's death. There was not finding that it was doing more harm than good. The letter does not say this. The doctor's affidavit of December 2, 2015, does not say this. The Physician's Certificate of December 2, 2015, says there is a possibility that Chris's condition could improve. TAL also claimed that members of the ethics committee met repeatedly with Chris's parents. The letter from the committee does not support this. It references one meeting. Plaintiff's Original Verified Petition filed in the 189th references one meeting. Moreover, since the make-up of the committee is not disclosed in the court documents (Plaintiff's recent pleading notes that they still do not know the names and credentials of everyone on that committee, see Plaintiff's Response in Opposition to Methodist's Special Exceptions and Motion to Dismiss at p. 2), and TAL members were not among Chris's advocates or attorneys, I am not certain how they would be able to say that various unnamed, unknown members of this committee met repeatedly with Chris's family. Presumably, Chris's treating physicians would have met with his family and also presented their recommendation(s) that Chris's life-sustaining treatment be removed, but this only shows how a conflict of interest is present to an outrageous degree in these cases. TAL then stated in the article that Chris's social worker filed an application seeking a family member or other third party to be his guardian. TAL claimed: "The hospital never applied for guardianship and, in fact, provided the court with names and known locations of family members." (Emphasis added.) We have already discussed how this is not true. One cannot say "never." The evidence clearly contradicts this. TAL argued that Methodist "voluntarily" agreed to continue life-sustaining treatment. We have discussed how that is also not entirely true. They agreed only after litigation began. They had no intention of doing so before then. How do we know this? Their letter of November 13, 2015, informing the family that the hospital would withdraw life-sustaining treatment, that's how. TAL seemed to really oppose the idea that the hospital intended to bring about Chris's death. In arguing about the hospital's motives, TAL went through a number of things that could be "plausible" about the beliefs of Chris's doctors or father or those that were fine with withdrawing his life-sustaining care and how these "plausible" "beliefs" mean they "could have understood Dunn's death as an unintended but foreseen side effect of a morally legitimate object. That object, by their own profession, was to stop the suffering caused by the treatment to sustain life." Again, the link goes to the document opposing expedited discovery. There is no pinpoint citation given to where TAL gets this "plausible" basis for withdrawing life-sustaining treatment that would cause death but would only be, according to TAL, the "foreseen side effect of a morally legitimate object." This is just stunning to me. TAL has apparently come out in favor of involuntary euthanasia to end suffering. I don't know how else to interpret this. What I have suspected is there in black and white. Apparently, I am not the only one to interpret it this way. The other part of this is just that it's absurdly illogical. Chris's death after the withdrawal of life-sustaining treatment at the decision of the hospital is merely "unintended but foreseen side effect." Death is a mere "side effect" of withdrawing life-sustaining treatment? Barring a miracle, it's going to be the ONLY effect. And it's "a morally legitimate object," according to TAL, to withhold care that will terminate a life if the doctor - not the affected patient or his family - says it's causing "suffering." Except that no doctor said that here even if that was morally legitimate. An attorney argued it in two motions without any evidence, much less statements from the doctors responsible for continuing care, that it "was to stop the suffering caused by the treatment to sustain his life." Again, that is not what the letter said. That is not what Dr. Uppalapati said. And, had they said that, it would not necessarily be morally legitimate just for that purpose and certainly not against a patient or his family's will. A person in possession of his mental faculties is not morally bound to choose treatments whose negative effects are disproportionate to any good that could come from them. By the law of transitivity, it would seem to follow that neither are his doctor nor his surrogates are either. Some may say that patients are the only ones able to judge the proportionality of suffering due to life-sustaining treatments. In this case, those treatments decreased the ability of the patient to judge. This is not logical either. A person without his mental faculties cannot make moral decisions at all. He may not even be able to make immoral decisions. What is missed here is that the patient here - and his closest surrogate, his mother - could choose. They chose life-sustaining treatment. There was no evidence that the benefit of that treatment was outweighed by any of Chris's suffering. There was no evidence offered that the medical benefit of the treatment was outweighed by any medical harm it was causing. Even the doctor did not argue this. TAL then admitted that its information was limited - after three paragraphs of "plausible" hypotheses. It again argued that "The physicians who cared for Dunn stated that their patient was suffering from his life-sustaining treatments, and the hospital ethics committee who met with the family surrogates and doctors agreed that it was medically inappropriate to cause that suffering." Again, where is this information coming from? It is not in the court documents, including the few that TAL posted. I have read the documents and then conducted a word search for "suffer." It appears on page 2 twice, when discussing the illnesses he suffers from. On page 3 the attorney argues that "his treating physicians concluded that he is suffering from the treatment necessary to sustain his life." On page 2 of Dr. Uppalapati's affidavit he uses the term to describe the illnesses Dunn is believed to "suffer" from. On the 42nd page of the 53 page document, you see the term used three times on the proposed Order where Plaintiff describes how he will suffer death if his life-sustaining treatment is discontinued as Methodist plans to do if the order prohibiting them from withdrawing his treatment is not signed. The bottom line is that other than an attorney's conclusion and argument - both of which are unsupported - there is no evidence of this key argument TAL makes all over the internet. TAL then argued that we must be careful in judging others. "The same moral law that demands that physicians 'do no harm' has implications for all of us: namely, doubts about others should be interpreted for the best. To do otherwise would be to injure them." Tellingly, TAL omitted the portion of the Hippocratic oath that TWICE demands that physicians keep their patients from injustice. I find it hard to believe that we are to give the benefit of the doubt to those who seek to do harm or deprive people of justice. And, justice is exactly what Chris's constitutional challenge to TADA is all about. Due process is fundamentally about justice. Finally, TAL admitted that TADA has problems. Now, TAL will say that they have been working to reform it for years, and but for Texas Right to Life, it would be done. I addressed that tired, predicable fall-back argument back in December. It is not true. In arguing here in the article on Public Discourse against treatment until transfer, TAL claimed this violates a patient's dignity. This is very much like the pro-euthanasia argument for "death with dignity." I have written about this troubling propensity some who are pro-TADA use that is very close to straight out arguing for "death with dignity" - a term long known to mean assisted-suicide and euthanasia. So now we have two arguments made by TAL using the language of euthanasia. This is beyond troubling. The argument about dignity was also used to argue, again, that the state would be forcing doctors to violate their conscience if they were not allowed to decide to withhold life-sustaining treatment against your will. There are a number of things to keep in mind here, which I have already addressed in my last blog post, as this was yet another predictable argument we've seen from TAL before. First, no such argument was made here by the doctors. That was not a stated basis for the committee's decision. That was not part of any affidavit by a doctor in this case. Second, if that was a basis for objecting to continuing care for Chris, why didn't a doctor file an affidavit asking to not be forced to treat him in the interim and asking that someone else be assigned? Third, if that were the case, it would be simply a matter of transferring care to another doctor. As noted, no doctor asked to be relieved from the alleged (by TAL) "moral burden" of treating Chris. Even if they had, there is more than one doctor practicing at Methodist hospital. I am certain of it. TAL's argument in Public Discourse and elsewhere that there has to be some conscience protection for doctors as a reform to TADA is an odd thing to argue since TAL is saying that the use of TADA in this case was justified on that very basis. TAL claims the doctors didn't want to treat Chris because that would violate their consciences and that the medical ethics committee was justified in its decision so that consciences would be protected. Ignoring the fact that there is no evidence consciences were at issue here, clearly, then, TADA is working according to what TAL thinks is necessary already. No reform is necessary on this basis. TAL's claim that reform is needed on this basis is disingenuous. In fact, every aspect of Sec. 166.046 is about allowing a physician to not honor a patient's or his family's wishes with respect to his care. It is all about the doctor already! The doctor has plenty of protection under TADA. Rather, the imbalance is on the patient's side. TAL also claims that doctors need protection from lawsuits as another area of reform needed for TADA. You will note, as I have said over and over, that TADA provides limitations of liability, immunity, from lawsuits as long as its provisions are followed. Section 166.044 provides specifically for a "Limitation of Liability for Withholding or Withdrawing Life-Sustaining Procedures." There are several other sections providing various "Limitation of Liability" provisions. Again, TAL's claim that reform is needed on this basis for TADA is dishonest. The problems TAL claimed exist with TADA - that somehow demonstrate that Methodist acted morally or ethically here - do not exist. The real problems are ignored by TAL which only gives only mere lip service to the lack of balance to patient or family concerns and rights. But, as sound moral theory has always attested, conscience can err, because an agent's judgment may or may not align with the moral law. The challenge for legislators and citizens of good will is twofold. First, they should reform committee processes in ways that, as much as possible, safeguard patients from erroneous judgments while protecting the conscience rights of doctors. Second, families and other institutions of civil society need to educate doctors, nurses, hospital administrators, and other medical practitioners from their youth in the knowledge and practice of sound moral principles, in order to properly form their consciences. Meanwhile, outside observers in cases like this need to realize that interpreting doubts for the best might mean that we err more often than not in our judgments. But it is better to err in this way than the converse, for it is better to have a good opinion of an evil person than to have an evil opinion of a good person. First, we have repeatedly tried to reform the doctor/committee-focused TADA to be even slightly more patient-oriented and TAL, the TCC, the Texas Medical Association, and the Texas Hospital Association has fought us. TAL's board member has gone on and on about how you can't subject these decisions to courts and lawyers. But here, in this article, TAL repeatedly pleaded for everyone to give the benefit of the doubt and think good thoughts about those whose "conscience[s] can err" and that it is far better to err on the side of thinking nice thoughts about those who hasten a person's death by the withdrawal of life-sustaining treatment (and the possible administration of medication to further hasten his death) who TAL admits might have erred in making that decision in the first place, a decision they should have no moral or legal ability to make. Second, TAL argued that we need some vague manner of educating everyone making the decision to terminate life-sustaining care on our morals. Well, in my experience, families have tried to do that during ethics committee hearings only to receive a letter very much like Chris Dunn's mother did. But I guess that's why we need to think good thoughts about those errant consciences. No. This focus is all wrong. TAL is more worried about what people think of those that withdraw care, even as they admit the propensity for erring in the exercise of conscience, than justice and life for the ill patient. It is unbelievable. But it is good to see where things stand in their own writing. We err, if we are to err at all, on the side of life. C. Dr. Hawley's Reply: "Life, Liberty, and Modern Bioethics: A Reply to Cooper and Nuckols"
Dr. Hawley was exceedingly generous, gracious, respectful, and thoughtful in his Reply. As he had before, he gave every benefit of the doubt while never losing sight of the overarching issue. The summary was: "In its zeal to deal with suffering, modern bioethics fails to account for the rights of the sufferer. There is no law that can legitimize taking a life too soon." He contended that they disagree on the facts of the case, not their moral philosophy. He noted that TAL (who he refers to as Cooper and Nuckols; I refer to them as TAL because they are speaking for TAL and TAL has widely promoted and distributed their response) "remain silent about my main thesis: modern bioethics strips from patients their two most fundamental rights of life and liberty." Rather, he noted, "they advance three collateral criticisms" to which he responds. First, they claimed he was not factually accurate. He expected a list of what they claimed he'd misstated, but they did not provide one. He replied that he disregarded speculative or inconsistent factual reports and also acknowledged where information was lacking. He explained that any additional information they provided he excluded "only because they have no relevant to my argument." He was focused on the overarching principle. He noted that there were only two factual elements on which they disagreed, but "neither of which is a central consideration in my argument." One was the guardianship dispute. TAL contended that Methodist was a disinterested party in that matter. Hawley referred to court documents showing that Methodist's employee sought guardianship initially. He stated that it is best that all of the documents be circulated. The other point of factual contention, he rightly characterized as a "mere quibble," was his statement that an advocate is not authorized to be present at the ethics committee hearing. This is true. TADA is silent as to advocates attending hearings with the patient or family. He then took issue with TAL's assertion that Chris was incapacitated and unable to make his own decisions. He explained that the problem here was that they omitted two key facts contradicting this assertion. Chris "had periods of wakefulness during which he responded coherently to questions about his medical care." And, second, "when asked if he wanted to continue living, he used clear and decisive gestures - nodding his head and steepling his hands in a prayerful, pleading appeal - to respond with an unambiguous 'yes.'" Dr. Hawley reminded everyone that both of these facts were verified by video taken three weeks after the committee decided to withdraw his life-sustaining treatment. I submit that his expressed desire should have both moral and legal standing. Cooper and Nuckols never address this subject, which, in my view, is all-important and the only reason we are having this discussion. Dr. Hawley said he "cannot reconcile the video evidence with the physician's assertions that this patient did not understand his situation and could not communicate." I have no doubt that everyone involved in this patient's care, including the ethics committee members, are persons of goodwill who were acting in what they believed to be the best interest of the patient. However, motive and intent are not the issues I am examining. It is the morality of their decision to withdraw life-sustaining care that I am scrutinizing, and I just it harshly. Second, TAL criticized "Hawley's argument [which] insinuates that the hospital and the attending physician intended to kill Dunn." Dr. Hawley replied, "Respectfully, I ask Cooper and Nuckols to point out where I wrote anything that even hints at an intention to kill." He noted a difference between knowing the result will be death and intending to cause death. He agreed with TAL's "very exacting description of what the medical team and ethics committee intended." Dr. Hawley said he, "stands by [his] contention that this case is an example of 'death by committee'" even though he "readily concedes that the physician and committee's primary intent was not to kill the patient (though it was foreseeable)." Thus, TAL's "related claim is false: '[Hawley] assumes that the hospital and attending physician are guilty of murderous intentions until proven innocent.'" As to TAL's argument about proportionality, Dr. Hawley said TAL offers no evidence to support that argument other than the physician's affidavit which is contradicted by the video (and even the Physician's Certificate). As he so rightly asked, "At that crucial moment in his life, who was better able than the patient to judge his suffering and make a valid choice?" Who, indeed? Secular bioethicists casually reject the deeply spiritual and redemptive aspects of suffering in the final days of life. This patient could have chosen to forego life-sustaining care, and, in light of his suffering and imminent death, that would have been an acceptable moral choice. Instead, he chose to continue living, and an entire institution rose up against him. I cannot fathom what moral imperative compelled them to override his wishes. Dr. Hawley cited to Wesley J. Smith who wrote, "Once avoiding suffering becomes the primary purpose of society, it too easily mutates into license for eliminating the sufferer." In my analysis, eliminating suffering is exactly what TAL said was a "morally legitimate object." Of course, to accomplish that - to eliminate what TAL claims was Chris's suffering (despite no evidence of that) - requires eliminating the purported sufferer: Chris Dunn. Third, TAL criticized Dr. Hawley claiming he "fails to account for important implications of the conscience rights of doctors." He agreed with TAL "that there is no natural law or constitutional right to endless treatment." On this I agree as well. There is nothing from me, TxRTL, or Chris's advocates requesting otherwise. Dr. Hawley agreed that doctors' consciences must be protected. On this, I also agree. I'd never argue that a doctor has to treat a patient he doesn't want to. Indeed, I'd not want a doctor treating me if he didn't want to as I would worry how conscientious he was being. I'd also never argue that a doctor has to perform abortions or prescribe an abortifacient or even contraceptive if it violated his conscience. Dr. Hawley replied, "If I 'failed to account' for physicians' conscience rights in this case, it is because I found no evidence that conscience had anything to do with the physician's recommendation to withdraw treatment." He observed that there was no mention of anything in the "[doctor's] affidavit, none in the hospital's court pleadings, none in the ethics committee's letter to the family, and none in any statement by hospital spokespersons." This was my finding as well. Dr. Hawley reiterated that he is "sympathetic to [TAL's] appeal for giving the benefit of the doubt to physicians in these situations, at least as it relates to motive and intent. But we also know which road is paved with good intentions; it is simply not sufficient to raise our glass in a toast to tolerance." Dr. Hawley concluded: "There is no law that can legitimize taking a life too soon. As Pope John Paul II noted in Evangelium Vitae, a 'culture of death' has laid siege to the modern world. We are called to be vigilant." As I have said, Dr. Hawley is a good man. I believe he very generously and charitably gives more benefit of any doubt to both TAL and Methodist than is warranted in this case. For anyone on the fence, that should weigh in favor of listening even more attentively to what went wrong here in the overarching issue I set forth in the very beginning of this post and which Dr. Hawley notes is the unanswered question by TAL in their Response to his first article. Sometimes what is not said is as edifying as what is. If you have been reading things on the Facebook pages of either TAL or TxRTL on this case, or have followed the last few sessions of the Texas legislature, you will invariably find comments sprinkled therein that amount to some version of: "This is just the latest episode in the long-running 'feud' between the two groups. Can't we all just get along? Just agree already. Anyway, I like X group or Y organization better." Sometimes people will mention the "feud" to attempt to detract or distract from the real issue because they don't want to delve deeper or, they know what the real issue is, but cannot justify it from a pro-life point-of-view when called out. People. That is not going to cut it. This issue is too important and it has nothing to do with the "feud." It does have everything to do with what is and is not the pro-life position on the issues of denial-of-care or end-of-life and reforming (if not completely eradicating) TADA. I explained some of this in my last post. See the section entitled "Red Herring, Straw Man, Anyone?" This is not a matter of reasonable minds being able to disagree or mere petty differences. To dismiss real consideration of TADA and what went on in Chris's case based on some "feud" is just lazy and irresponsible on your part. There is no splitting the baby here (just as there is not in abortion). Which ill person do you think the hospital should be able to euthanize? Which should it not? Where do we draw the line so that half of those who wish to have their life-sustaining treatment maintained can have it and half cannot? That would be splitting the difference, wouldn't it? Of course not. It's absurd. I say it to make that point. I will highlight some differences between the groups as I see it. Again, I do not speak for TxRTL. This is based on my own observations over the last several years and what I have read and heard directly from the two organizations. TxRTL believes that a patient or his surrogate should make the decision whether to terminate his life-sustaining treatment. TAL is fine with a doctor and hospital doing that against a patient's or family's wishes. TxRTL wants treatment until transfer. TAL opposes it. TxRTL wants more time to transfer. TAL opposes it or has offered very limited increases in time that have been shown to be insufficient. TAL promoted a faux reform bill in 2015 regarding artificially administered nutrition and hydration that had loopholes so large it was no reform at all. Only after TxRTL's significant amendments were added was it something that could be supported as an incremental reform. TAL promoted a faux reform bill in 2013 (SB 303) that was actually more of a due process nightmare than it is now. TxRTL and others successfully opposed it. TxRTL helps patients navigate TADA and helps find transfers for them and is on the registry of organizations that help patients. (See attachment to the November 13, 2015, letter from the hospital embedded above.) TAL does not and is not. The bottom line here is that you have to go deeper than just decide your position on a piece of legislation or a life-and-death issue based on whatever a particular organization or its followers says. You cannot use loyalty to some organization as a shorthand way to decide what you "think" about an issue. You cannot use mere talking points that it puts out. And you have to be willing to consider the possibility that an organization can be wrong on an issue, lose its way, be unduly influenced by something or someone that does not have pro-life principles at its core, etc. You have to be willing to strike out on your own, if necessary, on these fundamental issues of life and death. If it means that you lose some friends, so be it. You will find new friends, new allies on the issue, and some salt of the earth people, I assure you. It will also mean you stood for something greater than yourself no matter the personal cost. And, I think that means something. I support TxRTL on this because I think they are right. But I read every bill myself before deciding whether I support that bill or not. And, I promise you this, if TxRTL ever loses its way on this or other pro-life issues, I will not support them and call them out as I have TAL. It is above everything else, a matter of the issues for me. It should be for you, too. IV. Closing Thoughts. For Now. This is a very, very long post. I doubt most will read it all. It is here to set the record straight and make as complete a record of this case as I can, re-assert the overarching issue (who makes the decision to forgo life-sustaining treatment) that is so easily lost in the smoke and mirrors, and where the organizations stand. Why? Because Chris Dunn and his family deserved better. Because we must vigilantly oppose any and all encroachment of euthanasia in law (which TADA is), philosophy, and language. Because I know a great deal about this issue because of my prior involvement in TADA reform efforts, my limited involvement in an ethics hearing, my extensive reading and research, my legal background, and the opportunities I've had to talk to medical professionals about these issues to further my own understanding of these difficult situations. Because the fundamental issue with this law is being obscured by other, irrelevant things to avoid the real issue. Because it is for the patient to decide when life-sustaining care is to be withdrawn and it is in no way right, moral, or constitutional that a doctor and hospital should made that decision against the wishes of that patient or his closest surrogate. Because this law is a blight on this state and a risk to every Texan. Because this law is not pro-life. Because a family should not have to go to court to ensure that their ill loved one does not suffer a hastened death because an "ethics" panel decided his care was futile. Because everyone deserves due process under the law, including the ill.
Because Trey Trainor, Joe Nixon, Emily Kebodeaux Cook, Emily Horne, Elizabeth McClung, and everyone at TxRTL is working hard to make sure that all Texans have more rights when it comes to your health and well-being. Because the term "pro-life" should mean something consistently across each issue that touches on life and death. Because TAL is calling people liars, misrepresenting by omission and commission what its selective posting of court documents say, even when the truth is easily demonstrated. Because you need to know what the truth is to evaluate the credibility of these organizations going forward. Because a pro-life organization should not promote the idea that withdrawing life-sustaining care against a patient's or his family's wishes is a pro-life position. Because a pro-life organization should not promote withdrawing life-sustaining care to avoid suffering as a pro-life position when that is the very definition of euthanasia. Because TAL has now - while still calling itself pro-life - made statements that can only be reasonably interpreted as supporting and promoting euthanasia. Because conscience protection is already in TADA as physicians can transfer patients to other physicians if they do not wish to treat a patient. Because conscience was not an issue in Chris's case and there is no evidence to support that. Because the big issue here is not, as TAL would have you believe, erring on the side of not giving the benefit of the doubt to those whose consciences caused them to err on the side of withdrawing treatment. Because the case has to be made that we err, if we err at all, on the side of life. Always. I caution you. Do not take a strident or ardent position on this case or on TADA or on one organization over another simply because you typically side with one organization or another. In this case, you better really know the issues and do some independent reading. You may very well be surprised where the evidence and analysis takes you. Do not take a position based on one Public Discourse article posted about this case when there were three. Do not take a position based on one PDF of documents from the Court that does not include everything and when other documents easily contradict statements made about that PDF and what is in that PDF is not as presented. Know the difference between evidence and argument. Know how to keep the focus on the real issue and not get distracted by a million side issues and details (even as I've gone through some of those myself here for your benefit). Yes, I've taken a position on Chris Dunn's case. I've taken a position on TADA. And, I've now taken the most public position so far on which organization stands for what based on my own research and analysis of the issues, legislative efforts, committee testimony, and public writings. But in so doing, I have given you here a compendium of evidence to support why I'm where I am on all of this. What you do with it is up to you. You may or may not agree. That's up to you. My job is to inform, not convince. *I have provided a timeline of just about every major pleading filed in both cases. A few documents were omitted, such as fax cover sheets, returned citations, notices of hearings, which contain nothing substantive. Again, you are free to check the records yourself.